alaTest has collected and analyzed 29 reviews of Sony Handycam DCR SR38E. The average rating for this product is 4.4/5, compared to an average rating of 4.0/5 for other Camcorders for all reviews. People are impressed by the size and zoom. The image quality and portability also get good feedback, but there are some negative comments about the viewfinder and price. We analyzed user and expert ratings, product age and more factors. 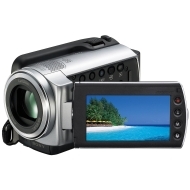 Compared to other Camcorders the Sony Handycam DCR SR38E is awarded an overall alaScore™ of 79/100 = Good quality. alaTest has collected and analyzed 1 user review of Sony Handycam DCR SR38E from Amazon.co.uk. The average user rating for this product is 5.0/5, compared to an average user rating of 4.0/5 for other Camcorders on Amazon.co.uk. People are impressed by the usability. The portability also gets good feedback. Some have doubts about the price. Great, practical video camera and easy to download films. None to speak of yet. Very difficult to use with sun on screen. There is no viewfinder so pictures of moving objects like kids and animals running around is pure guesswork. Excellent product, reasonable battery life. Good quality images. Sony mini tripod adds some extra professionalism. Could do with a night time recording facility andbe packaged with a somthing to carry it in. I use DSLRs normely I bought this digycam to try out instead buying the higher value sony camcorders and I find it does everthing i expected with good quality results, And I wiil buy one of the larger ones soon. needs a grip of some sort for those of us with larger hands, I would rather have knobs and dials instead of touch screen. Very easy to use and quick to transer files to the PC. Compact and lightweight with a smooth responsive zoom. Artificial light conditions produce yellowish results.